The perfect expression of tireless style and modern beauty, this floral wall lamp glows with soft colors. 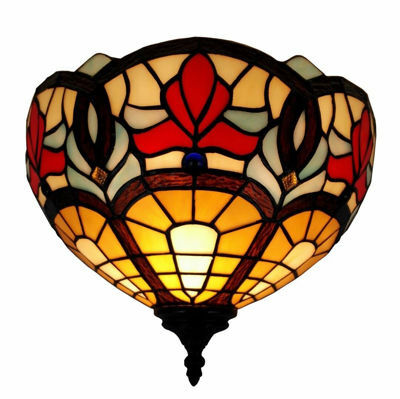 The piece is handcrafted using the same techniques that were developed by Louis Comfort Tiffany in the early 1900s. Illuminate a dark spot in your living room or entryway with this gorgeous wall lamp that boasts a cheerful yellow background with a pink and brown-green motive and red beads decorations.Â This fixture requires one 40-watt bulb for warm lighting.